Founded by the Benedictines of Downside in the 1930s, it originally occupied ‘Paddockhurst’, the stately home built by Lord Cowdray, which sat in 500 acres of beautiful, rolling countryside. The school expanded throughout the C20 and in 1975, their spectacular Modern Abbey Church was consecrated. Designed by Francis Pollen, this relatively recent building is Listed, and regarded as one of our very best postwar churches. Around these two key assets we see a variety of structures, some originally forming a Victorian ‘model farm’ and others designed much later, again by Pollen. 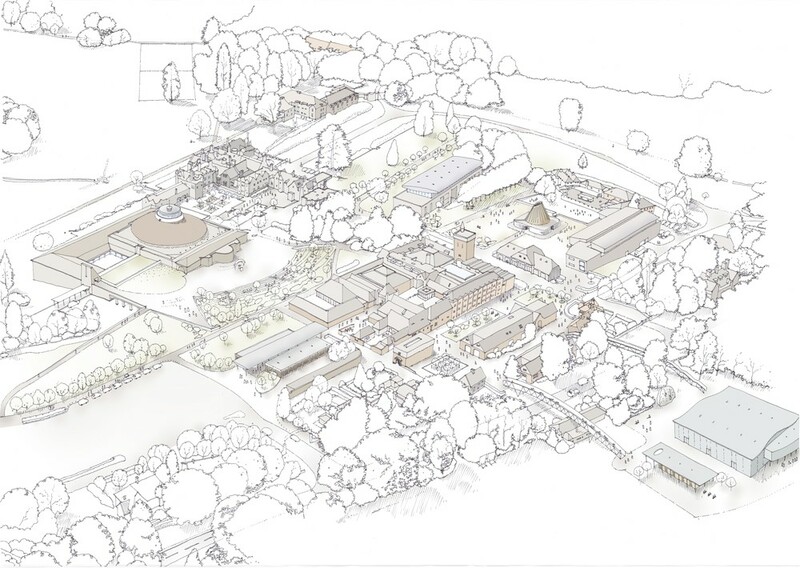 As is often the case, development has continued for a century without a consistent ‘guiding hand’ and in recognition of this fact the Abbey and School sought, by invited competition, to find an architect to develop a visionary masterplan to identify and address monastic and educational issues and opportunities. CGA has spent a year consulting with key stakeholders and developing the plan, which is nearing completion. In addition the practice is advising on the evaluation and enhancement of a variety of existing buildings. CGA is delighted to be assisting Worth in looking towards an exciting and ambitious future.